Reviewer’s Note: There’s been a kerfuffle over social media lately about whether adults should read “young adult” novels. The professed thought was that adults reading novels written for young adults lowers the standards of fiction. I obviously do not hold to that opinion on many levels. I am an adult (at least in age if not always in action) and I read anything that has a good story, including the Young Adult genre. Some of my favorite YA authors include Molly Cochran, Shannon Delany, and Maria V. Snyder. I should not have to add J.K. Rowling to that list or Susan Collins; that goes without saying. So, yes, I read Young Adult. I did fifty-odd years ago when I was a “young adult” and I do it now when I’m not. If the story’s good, I read it. Skylar Rome is haunted by her father’s disappearance, something that her mother won’t discuss. Skylar’s last summer with her cousin Kayla before they both go to college is supposed to be filled with fun. There’s a bit of fun but there’s more excitement, danger, and intrigue as Skylar gets to know Mason and his brothers. Is there something between Mason and Skylar? Is Mason more than he seems? Is Skylar? Mary Ting writes an intricate story with a clarity that brings out the emotions of a teenager. Since Skylar’s father left, she and her mother have been each other’s rock. But her mother finds love again and becomes engaged; where does that leave Skylar? In this first book of a series, it leaves Skylar staying with her cousin for the summer, and working in her aunt’s diner. It also shows her developing an attachment to an unusual young man named Mason. Skylar’s friendship (she wants it to be a romance but Mason has a wall around his heart) with this strange young man leads her into dangerous encounters with strange beings. Ting has built a world that blends the supernatural with age-old myths and the doubts of youth and she does it well. At a time in life when we all search for identity, Skylar and Mason’s search could be dangerous—neither is what they seem. Mason and his family seem to hold many secrets that are slowly revealed to Skylar. But although Ting gives the reader some hints she expertly keeps the big secret in Skylar’s own life for the end, providing just enough cliff to hang the next book on. Are the myths of the ancient world important today? Ting obviously believes they are and bases a fast and fun read on that belief. 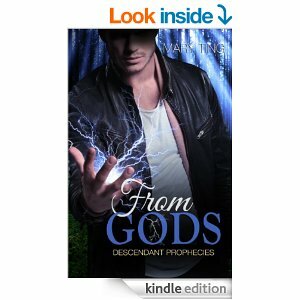 I look forward to reading the next From Gods book.